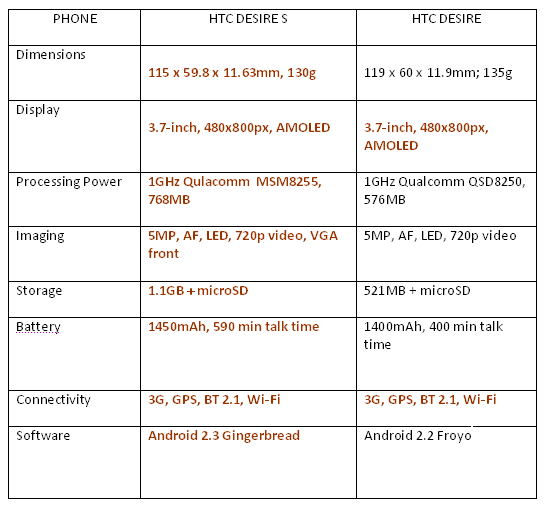 HTC Desire vs HTC Desire S, Should You Upgrade? HTC Desire S will hit Phillippine shores this Monday, April 11, 2011 as reported, and is expected to retail at Php25,990. This is a very attractive price considering that the original HTC Desire retailed north of Php30,000 at the time of its release. The HTC Desire S is an upgrade of the HTC Desire. The HTC Desire was released in 2010 and became an immediate hit for HTC. The fact that it is practically identical to the Google Nexus One helped its popularity and boosted HTC’s reputation as a serious smartphone maker. Fast forward to 2011, HTC is about to release an update of the HTC Desire. We would expect that HTC will come out with something as spectacular as the original HTC Desire when it came out in 2010. Sadly, though, the HTC Desire S is really not much of an upgrade. HTC probably believes there is nothing wrong with the original HTC Desire so why fix it? The problem is, too many good smartphones are available now, and I do not see how the HTC Desire can effectively compete. For current owners of HTC Desire, the question is, should they upgrade to the HTC Desire S? The answer, as you have already guessed, is no. Lets compare the essential specs of both devices. In the table below, the items in red are superior than the ones in black. If they are both in red, it means they are tied. So, how different are the two phones? Lets start with the physical aspects. The original HTC Desire measures 119 x 60 x 11.9mm and weighed 135 grams, while the HTC Desire S measures 115 x 59.8 x 11.63mm and weighs 130 grams. The new Desire is smaller and lighter but not by much. The screen size and resolution are identical on both devices. The HTC Desire S has no physical buttons, which may be good for some. Personally, I prefer physical buttons. In terms of power, the two are not much different. The original Desire carried a 1GHz Qualcomm QSD 8250 Snapdragon processor, a 512MB ROM and a 576MB RAM. The Desire S uses a 1GHz Qualcomm MSM8255 Snapdragon processor, a 1.1GB ROM and an 768MB RAM. The Desire S wins here but again, not by much. Software-wise, both carry Google Android with HTC Sense UI. The difference is, the original Desire shipped with Android 2.1 and was updated to Android 2.2. The Desire S, on the other hand carries Android 2.3 Gingerbread. But since the original Desire is bound to be updated to Gingerbread, there is really nothing different between the two devices when it comes to software. Connectivity options for both is also not much different. What certainly goes for the HTC Desire S is the VGA front-facing camera, something that’s important if you’re into Skype or video calling. The specs of the back camera for both phones are similar though. There is clearly no real incentive to upgrade to the HTC Desire S if you’re coming from the HTC Desire. If you are not a current HTC Desire user, though, and is considering this phone, it is still a good option. The HTC Desire S is a very capable phone. But also consider other phones like the Google Nexus S, which is retailing at around Php24,000 in Greenhills. Or you may want to hold out until the dual core Android phones arrive. Good Point! the only thing why I want to upgrade from Desire to Desire S was the internal memory since you really need those extra MB to save apps that cannot be moved to SD right? And of course, that will minimize the “memory full” notification.